A close up picture taken of Mt. Rainier form the north side. This picture was taken on top of a hill in Bonney Lake, Washington near the Sky Island housing development area. On clear days, Mount Rainier dominates the Seattle - Tacoma skyline, towering over the metropolis in breathtaking beauty. 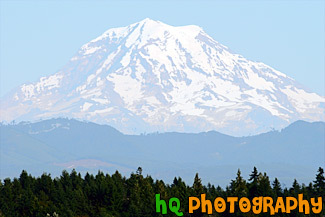 Mount Rainier’s highest elevation is 14,410 feet which is located at the summit.